McGregor brought two UFC championship belts with him, though he holds no title, and a bottle of his Proper No. Twelve whiskey. NEW YORK — Conor McGregor bellied up to his makeshift bar, plopped his dress shoes on the table and took a swig of his own Irish whiskey. Take a shot for every profanity belched out by the returning star? 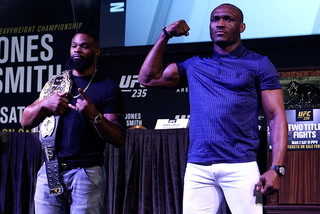 But UFC can raise a glass to the return of the most loquacious, wicked and perhaps the pound-for-pound most bankable star in the promotion’s 25-year history. McGregor sat on the Radio City Music Hall stage — the second home for Santa Claus — and used his four-letter-word power of persuasion to make believers out of his doubters that he’s ready to shake off any rust and beat Khabib Nurmagomedov in the main event of UFC 229 in October. “Don’t come at the king! 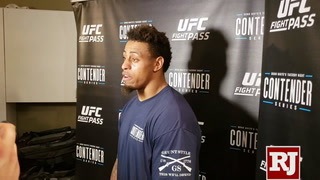 Don’t ever come at the king,” McGregor bellowed. Get your G-rated hyphens ready. Conor ——— McGregor is back. 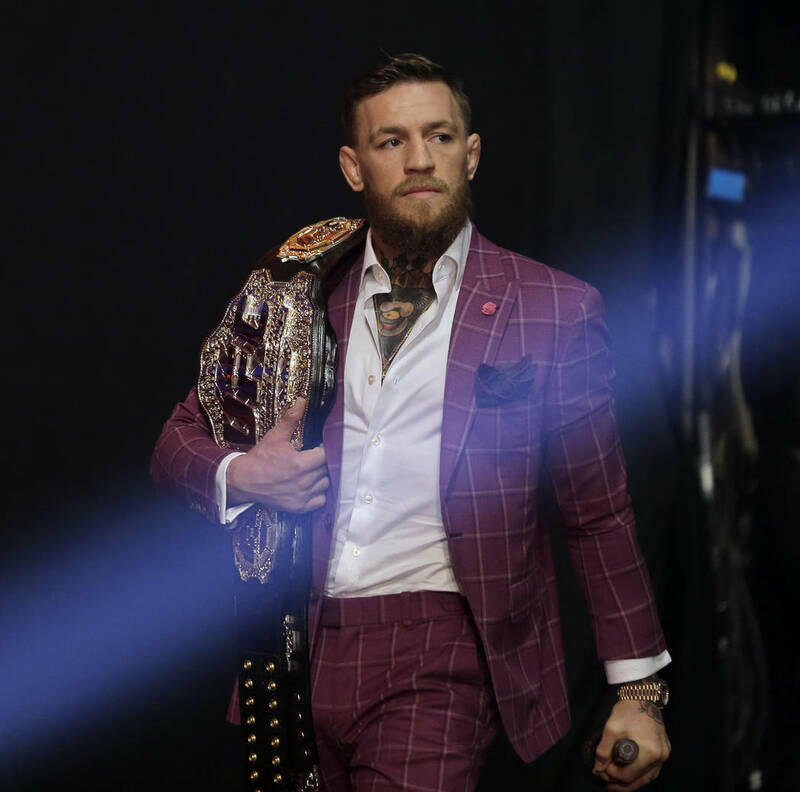 McGregor headlined one more time in a fitting city to hype his comeback after a two-year hiatus — he last fought in November 2016 at Madison Square Garden and it was this past April in Brooklyn where he used a dolly, chairs and guard rails in an underground rampage, with Nurmagomedov his intended target. 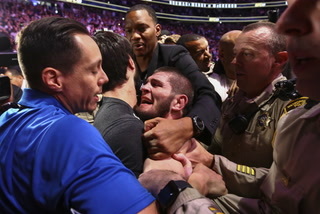 McGregor was arrested, and was sentenced to perform five days of community service, avoiding jail time in a plea deal. 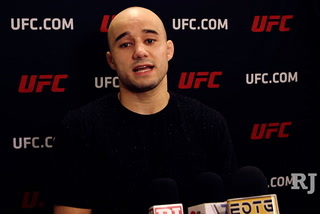 The commotion was one reason UFC put the kibosh on the tradition of allowing fans at the presser. 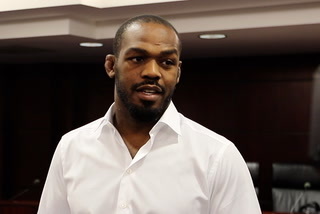 “I don’t want any problems in New York today,” UFC President Dana White said. No one can put a lid on McGregor’s mouth. 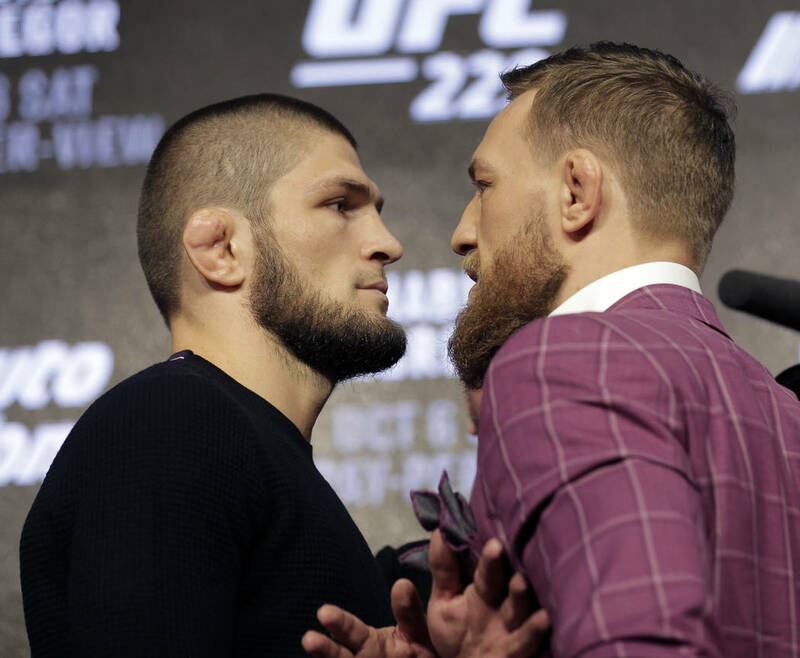 McGregor and Nurmagomedov will meet on Oct. 6 in the main event of the UFC 229 pay-per-view show at T-Mobile Arena, the same spot where Floyd Mayweather stopped McGregor in the 10th round of their one-sided prizefight. Nurmagomedov (26-0) is a formidable challenger for McGregor in a return from a 23-month break in MMA competition, but McGregor has never backed down from a challenge. 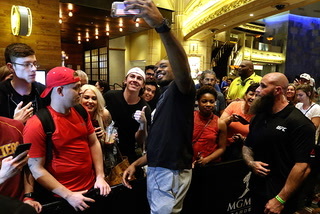 McGregor was guaranteed $30 million last year in his ballyhooed boxing match against Mayweather, and White openly wondered if his star attraction would ever return to the cage. 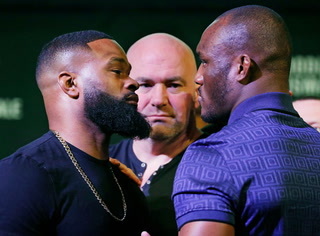 Bank on it: White is now predicting at least 2.5 million pay-per-view buys for the most anticipated main event of the year. 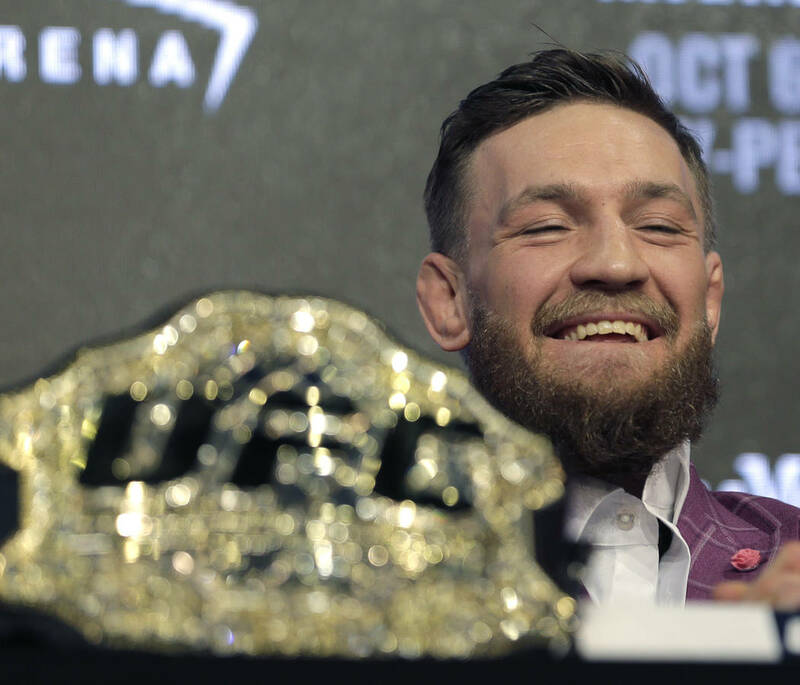 McGregor loves the show as much as he loves a fight. 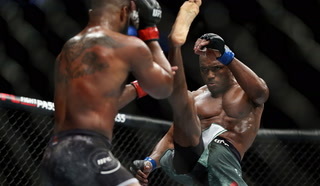 He was over-the-top at times, peppered his sentences with profanity, shouted over Nurmagomedov whenever he had an opening and carried on like the boisterous entertainer he is to sell the bout at a press conference aired live in Times Square. McGregor (21-3) simultaneously held the featherweight and lightweight championship belts during his meteoric UFC career, but he hasn’t fought in MMA since taking the 155-pound lightweight belt from Eddie Alvarez in November 2016. 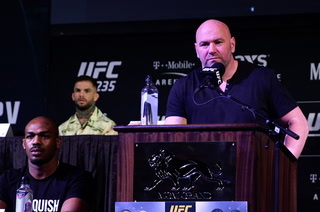 Wearing a maroon plaid suit, McGregor brought props, refreshments and even had a punching bag — yes, that would be Nurmagomedov, the UFC lightweight champ — in tow for his 30-minute monologue. 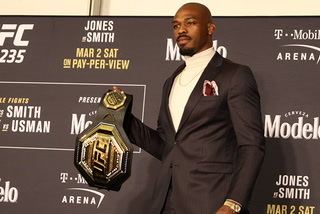 He raised one bottle of whiskey toward the crowd and pulled a smaller one out of the inside pocket of his suit coat (to avoid security, he joked) with him, shilling his latest business venture as much as his next fight. McGregor even offered a shot on the house to Nurmagomedov for his 30th birthday. Hey, who would pass that up!? “I don’t drink. 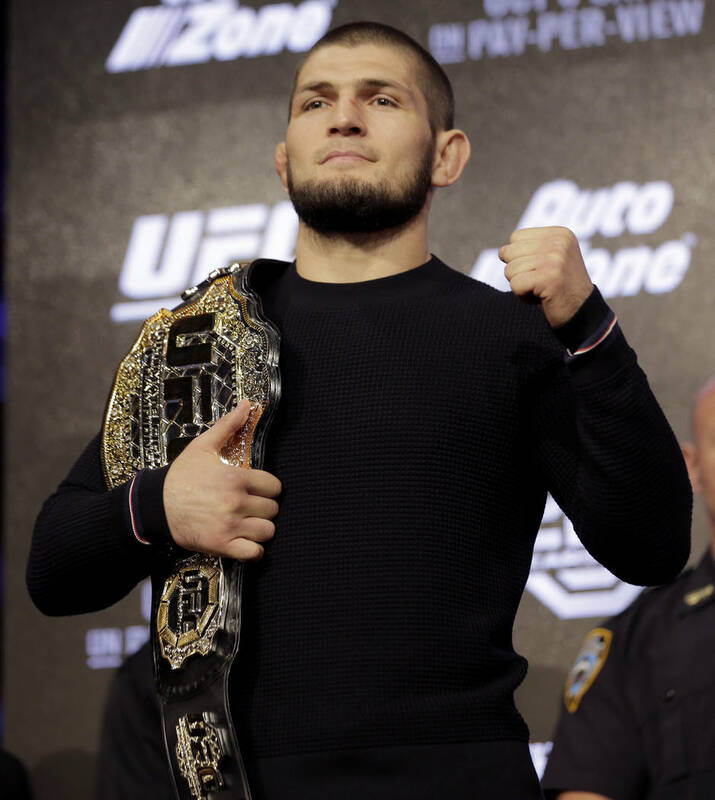 I never drink,” Nurmagomedov said. 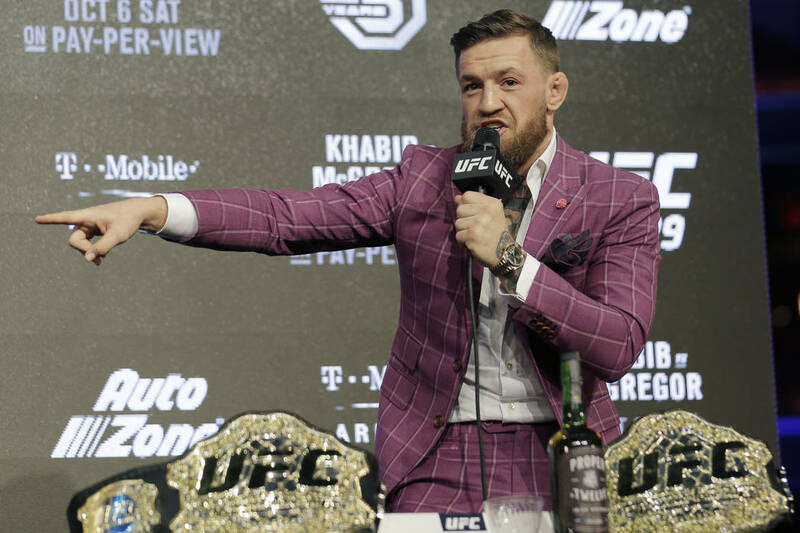 McGregor put his own profane twist on one of George Carlin’s seven dirty words to describe Nurmagomedov’s snub and continued to brag about what would happen in October. “Stomp on his head while he’s unconscious,” McGregor said. That was the part of the presser were UFC fans would usually howl and scream and McGregor would play to the crowd. But it was eerily quiet at Radio City — so quiet you could hear every f-bomb drop — except for the trash talking. Nurmagomedov sat bemused at McGregor’s rants. “You come for money, I come for legacy,” Nurmagomedov said. 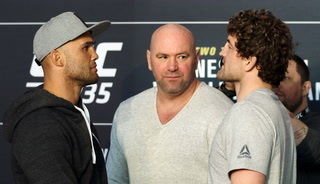 “You think whiskey is going to help you,” Nurmagomedov said. Yes, at times this was about the unhappiest happy hour in New York. Leave it to McGregor to get the last word — and the last call. “Are we going to crack open this bottle,” he said.